One of the sad facts about collecting sportswear is that the clothes and accessories were usually subjected to hard use. 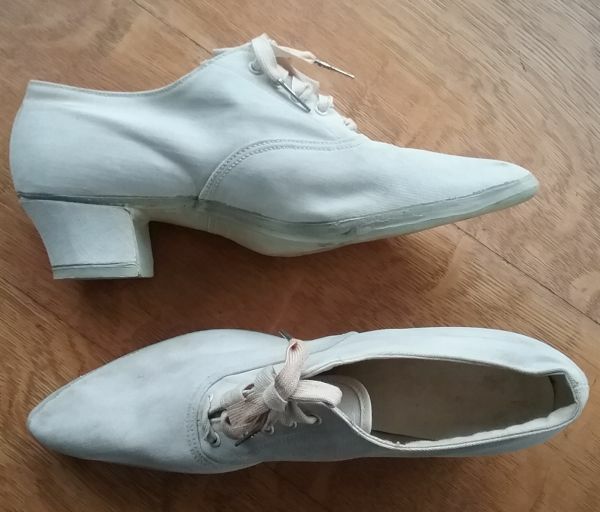 For that reason there seems to be at least a dozen pairs of 1920s fancy dress shoes on the market for every pair of canvas sporty ones. So even though the circa 1918 shoes pictured above are not particularly pretty or stylish, they are in really great shape to be sport shoes that are one hundred years old. 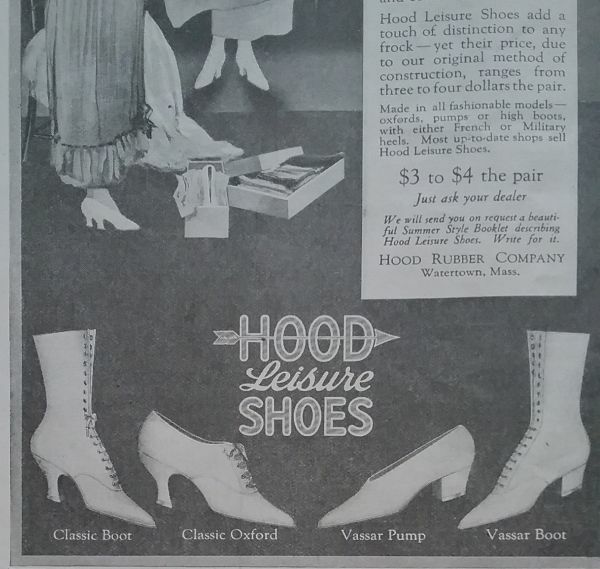 Hood is not a well-known brand name today, but at the time these shoes were made, Hood Rubber Products was a major player in the rubber products industry. The company was located in Watertown, MA, and was founded by Frederic and Arthur Hood in 1896. By 1920 they made a variety of rubber products and had a work force of over 10,000 people. At peak production, Hood turned out close to 90,000 pairs of shoes a day. This ad from 1918 shows my shoes, the Classic Oxford, though they have the lower heel shown on the Vassar Pump. I’ve seen many photos from the late 1910s and the 1920s showing women in tennis attire wearing this style shoe. I found an interesting tidbit about how Hood wear-tested their new products. They used the children of employees, giving them shoes to wear for a year. 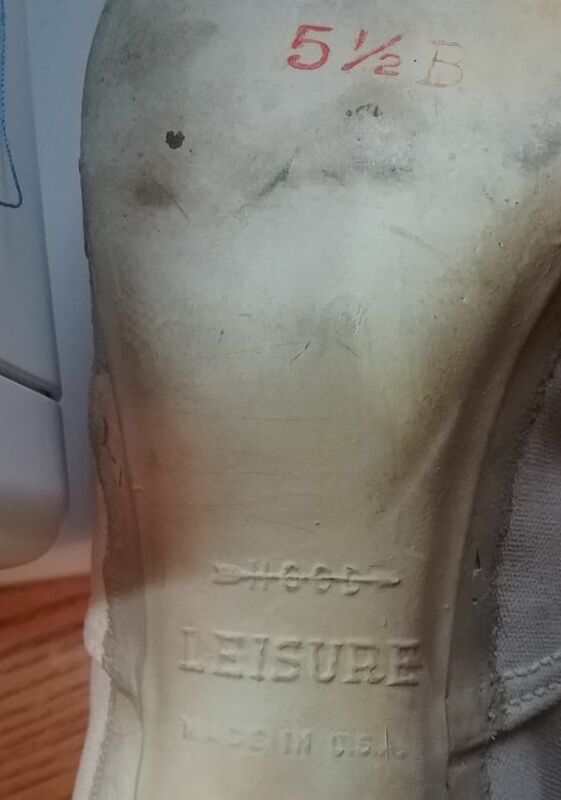 After that time the shoes were turned in to the company where the wear was analyzed. Then new shoes were given out for the next test period. 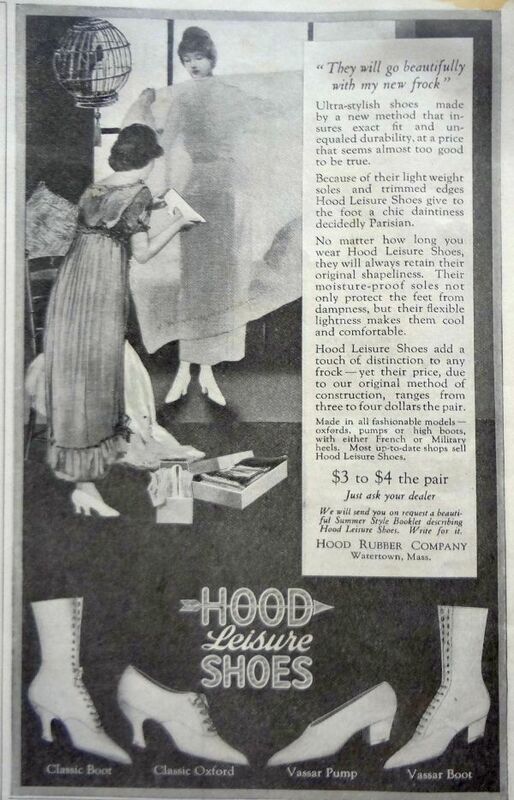 In 1929, Hood was bought by a competitor, B.F. Goodrich. Shoes under the Hood name continued to be made, along with Goodrich’s own brand. 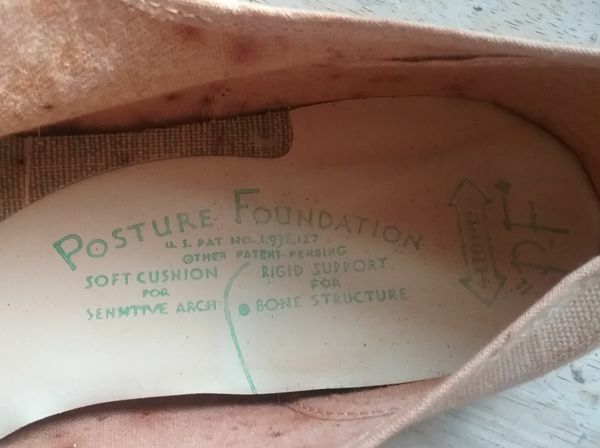 In 1933, Hyman Whitman was granted a patent for an arch supporter, which was obtained by B.F. Goodrich and became the basis of their “Posture Foundation” sole. This became the famous PF Flyer tennis shoe. Above is part of a B.F. Goodrich ad from 1947. 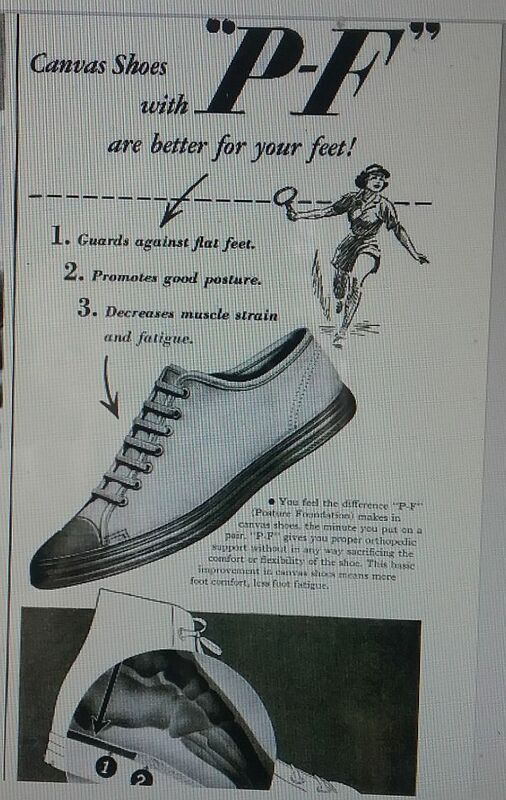 PF Flyers were initially a shoe for children, but the PF arch supporter was used in adult shoes as well starting in 1937. What I did not know was that shoes manufactured under the Hood name also used the PF arch supporter. This is the insole of a pair of circa 1948 tennis shoes from the Jane Hefner estate. It has the PF name, along with the patent number of the arch support owned by B.F. Goodrich. I would have thought these were the Goodrich brand if not for the Hood trademark right above the “PF”. Here are Jane’s tennis shoes. They are in quite a poor state, not because Jane wore them to death, but because of improper storage. 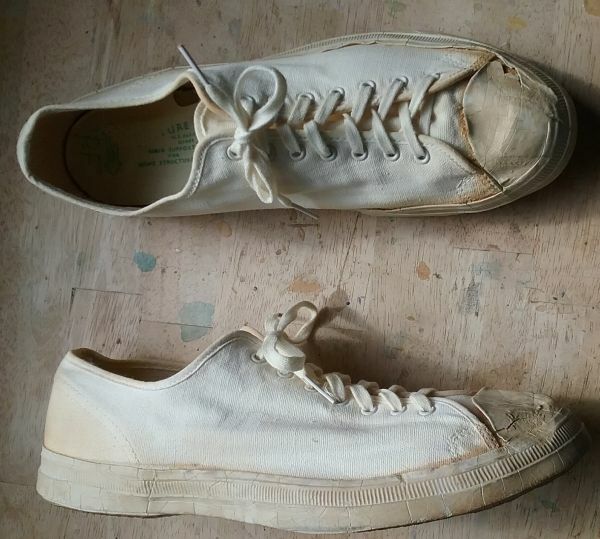 The canvas is not worn at all, and the soles show no signs of wear either. I suspect these were bought because of a requirement for gym class. Jane was not an athlete! Her casual shoes were a pair of well-worn saddle oxfords. In 2001 the PF Flyer name was bought by New Balance, which still makes the shoes. Hood stopped production in 1969, but the brand has been relaunched as a maker of men’s rubber-soled boots. Thanks for this 9 nfo on Hood – love to learn! Interesting post, thanks. Good thing those shoes of yours are a 5-1/2 and won’t fit me, otherwise I’d have to steal them : ). I wonder if Jane did wear these since she did have a tennis racket. Thanks again for featuring her clothing and shoes. I remember my favorite PF Flyers. Styled like classic Keds but had sherbet colored stripes (heel to toe). Loved them.